Twitter and FriendFeed have sparked serious controversy over the last few weeks – and now the controversy is surrounding super users like Robert Scoble. As Twitter searches for a business model and stability, Om Malik argued that perhaps both can be achieved by charging super users like Scoble (@scoble), Michael Arrington (@techcrunch), and Loic Lemeur (@loiclemeur). I completely disagree. Scoble, Arrington, Loic and the countless other web 2.0 celebrities (Guy, Calacanis, etc) are Twitter evangelists and the type of free marketing that most companies pay for via traditional marketing… they are unpaid spokesmen. Why would Twitter turn around and charge them for usage? Nearly 20,000 people follow @techcrunch – meaning that 20,000 users find Arrington’s tweets interesting and useful. 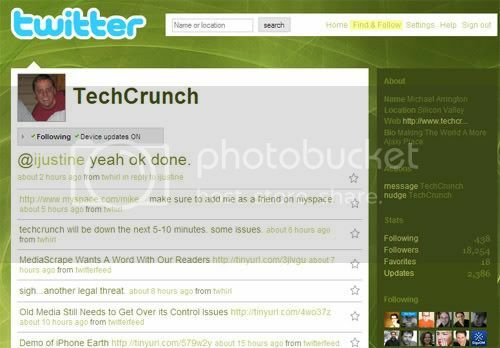 Does Twitter need @techcrunch more than he needs the platform? It’s tough to argue at this point – but I can argue with certainty that Twitter needed Arrington and other powerful early adopters at launch. Turning around to selectively charge him (as a power user) not only strikes me as hypocritical - it affects 20,000 ordinary users whose first experiences with Twitter likely came from power users. Moreover, power users on Twitter are only power users because their audience enables - dare I say demands - their frequent postings. I am a big believer that markets correct themselves. If Scoble twitters too frequently or too obnoxiously, he will lose followers. Instead of charging users for usage, I am a firm believe that Twitter should charge users for data… and perhaps this is where the business model arrives from power users. Let’s use @techcrunch as a continued example. Arrington often pushes out new posts through his Twitter account - reaching 20,000 new potential readers. But, based on my experience on a much smaller scale, he likely has little to no understanding of what happens next. Users start coming in from so many disparate sources that measuring the impact of his Twittering is damn difficult (or even currently impossible). Would Arrington pay for more detailed information about what happens after the tweet? How about relevant on-Twitter search data? Or competition? Equally important - I believe that this sort of usage would be good for Twitter (beyond the revenue) as it makes its users more effective communicators. By understanding my usage and its impact, I am likely to use Twitter more often and more effectively. Another example of the market correcting itself. Compete has taken an interesting step into charging per-query, but I think the solution is likely a monthly charge.